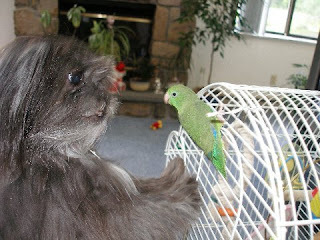 The Winner of the February Pet Photo Contest is..
Congratulations Ood Sigma! You obviously were a very special boy and loved by so many. We're so happy to name you the winner of this month's contest. Your photo will be PetsJubilee team store avatar for the month of March so that everyone may remember you. 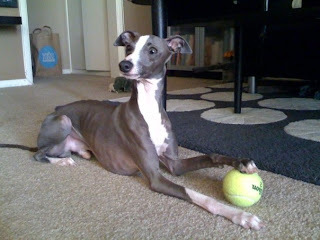 Sigma has won a free PetsJubilee Pet Sampler box for the next generation in his household. Sigma's mom runs the DarkSideOfTheSun shop on Etsy. Please visit her store for chain mailled jewelry. 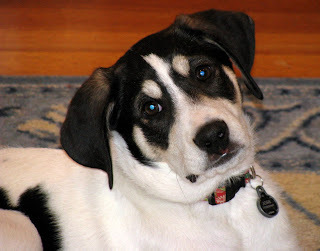 "Maddie (aka Miss Madelaine May) is a beagle/German shepherd mix. Although she is 14 years old, she's still full of energy, loves to play, and go for walks. Winter is her favorite season; she bounces around like a puppy whenever it snows. She strongly believes that it is her life's mission to bark at any squirrel - real or imaginary - in a 5-block radius." Not so much FURRY BUT she's cuddly & prickly & super CUTE! 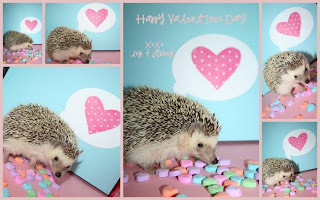 We Both want to wish everyone a super SWEET Valentines Day! 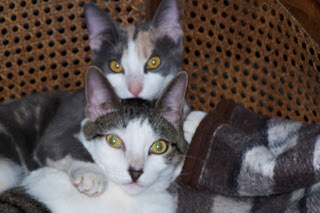 "These are my two kitties, Chester (in the front) and his sister Maya. I "trapped" them almost four years ago and we couldn't ask for better cats. I caught Chester two weeks before Maya and it took less than a week to spoil him rotten. He wasn't too thrilled when his sister showed up and was so jealous after she accepted us. They still have their moments but spend most of their time cuddling." "This was on a very rare snow day in Texas. 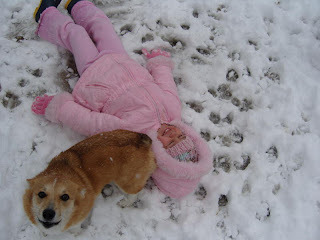 Our daughter was playing out in the backyard, trying to make a snow angel. Bella decided she needed to help!" 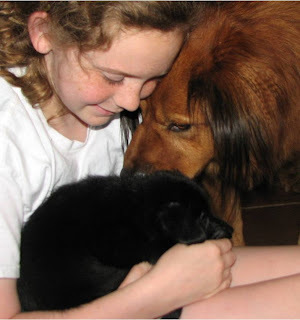 "After our dog Chloe went to dog heaven, we thought we'd never be the same. And we aren't. But a week later, my husband showed up with a puppy in his arms, a flea ridden, weak little fella who needed a family to love him. Our big, fuzzy Baxter took right to this teeny guy, who turned out to be a dachshund mix. We named him Roscoe, and he spent his first month with us sleeping on Baxter's fuzzy tail. Roscoe is now a vigorous dog who is so loving, he absolutely rejoices any time he sees you. He still follows Baxter everywhere, and is in head over heels in *love* with our kitty, Nadia. "This picture is of my beloved Spirit Horse herd. 11 equines in total, these horses gallop boldly and graze freely on 100-acres of beautiful pasture in central Colorado at the base of the majestic Sangre de Cristo Mountain Range. These incredible and majestic horses are a daily source of inspiration to me. To this day it still takes my breath away when the take-off galloping together across the fields kicking up their heels. Words can not describe the way the earth feels under foot when they run by. Each member of the herd has their own unique, special and sometimes painful story. Most neglected, abandoned or mis-treated, they each now find peace and love within our sanctuary at Spirit Horse Ranch." We're just filling up space so that no one has to have an "unlucky" number. "Max [our Mastiff/shepherd mix] and Rusty [our dachshund]. The boys usually hang out together, wrestle over toys together, and crash at naptime together." "These two are Tigger and Shadow. Mr. Shadow is showing once again just why his name is Shadow. He is a black Havana rabbit who loves to hang out in front of things that make him seem to disappear. Now you see him, now you don’t. This stealth bunny loves popping up from his hidey places without warning and scaring you to death. Princess bunny Tigger is a Harlequin rabbit mixed with something else since she has the Japanese Harlequin coloring but is only half the size for that breed. She is quite happy to steal the limelight and isn’t at all shy about showing off all her good sides. Bring the camera out and she will pose. This picture tells the tale of all the things they love best. They have made a mess ripping up the cardboard with their fearsome little teeth and now are snuggled up side by side napping until the next round of play (destruction) begins. Tigger and Shadow have been quite a tempestuous pair for their almost nine years together! 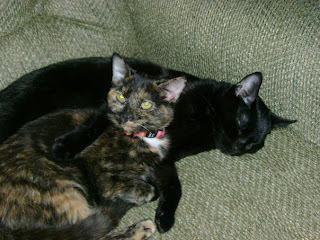 "Here are my furbabies: Scout and Toby. Believe it or not they're not related. Toby (on the right) is from Phoenix, AZ and Scout (on the left) is a rescue from a shelter in Las Vegas, NV. But whether they are related or not, they are definitely "brothers" when it comes to love. 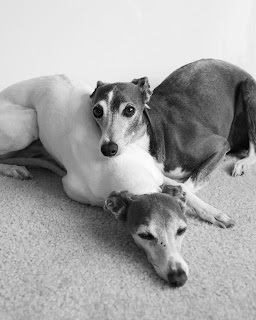 They are Italian Greyhounds and this is their favorite hobby: snoozing and cuddling together. I draw pet portraits for a living and I joke that they are my main form of advertising! Pet lovers invariably come up to me and ask what breed they are, allowing me to meet tons of new clients. So they pull their weight when it comes to the family finances! But their most valuable contribution to my life is the unconditional love they give me every day. In the words of Roger Caras: "Dogs have given us their absolute all. We are the center of their universe. We are the focus of their love and faith and trust. They serve us in return for scraps. It is without a doubt the best deal man has ever made." "This is my goofy orange cat Simon. He is a rescue cat, saved from being abandoned by a family forced to leave their home. He was part of a newborn litter of kittens born to a very young female cat. When I went to get them, the house was empty except for this one cardboard box with momma and three kittens. Needless to say, they came home with me. I still have the momma and Simon. The others found homes. 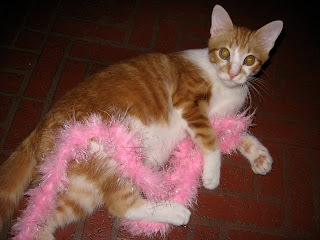 Simon loves his pink boa. He stole it from my daughter's room and now it's his favorite toy. We tell him he's silly, but he will actually growl if you try to take it from him!! Vote for Simon! mention running? He loves kisses too. Don't yawn near him or he'll get the roof of your mouth. In this picture, he is resting after some vigorous ball time. This was his own pose with his ball and he waited patiently while we got our camera. 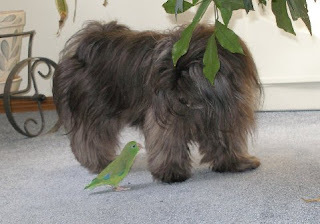 "An unusual love affair between Gianna the dog and Giacomo the 4" tall Parrottlet. They are truly obsessed with each other. Giacomo likes to preen the fur on Gianna's toes, and he chases her across the living room floor. Gianna is always looking for him, and knows his name.."
"This is my newest pup Josie, she is #4 for me. Josie was adopted on Dec 7th , 2009. Josie along with 5 brothers had been dumped outside our local animal control center. Josie is currently 5 months old. One of the most special things about Josie is a perfect black heart shape on her right side. Josie came into my life when I needed her most. The year had been a very difficult one for me emotionally. I had two big losses during the year and was down and out emotionally. I had three other dogs but, I was still missing something inside. On Dec 7th I went to a local fundraiser/adoption event for black and white cats and dogs. It was love at first site. Animal Control had named her Valentine because of her black heart. Josie has been sent into my life to help lift me out of a hole I was in. Josie has settled right in with her new brothers and sister and hopefully she will one day become a certified therapy dog just like her older brother and sister. "I want to introduce Peggy. She came to us 2 years ago while her mistress became very allergic to dog's hairs. Our dog just died and our vet made the contact. It was love at first sight. And I think from her too. We all enjoy the company! 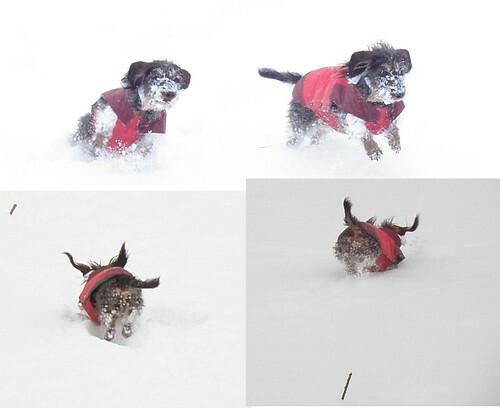 I took some pics of Peggy in the snow, she loves to run and jump in it!" In this photo, he tuckered himself out with my younger one's favorite teddy, and takes a little nap with it." "This is Toby--our 6 month old chihuahua mix. In the month since we rescued him, he's shown that his absolute favorite place is the bed, as far under the covers as he can get!" "This is Baby. Baby will be 5 years old in July. We share the same birthday. We adopted Baby two years ago as she had been abused. She did not bark for 3 months - we thought she couldn't speak. She was terribly timid and our hearts broke! We realize now she was just too afraid to speak her mind. We love her so much and spoil her. Now she barks and speaks her mind all the time. We never tell her to "hush". We love our little girl and she has more clothes than her mommy! She loves her "photo shoots" and every month my little model has a new theme. Her Mommy plans a Calendar for her little "Calendar Girl". She loves her new mommy and daddy and sleeps with us every night. Baby loves attention plus plenty of affection. She gets more than her share in her new home. We love her so much! 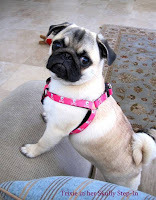 "She’s almost 11 months old and a little sprite of a girl and drives her two older Pug Brothers insane…Ha..!!! They aren’t really her “Blood” brothers, but I have two older male Pugs and they both love and hate their new baby sister. She’s a handful for sure, but we love her to pieces." 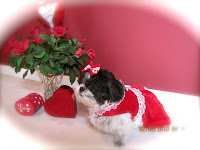 February Pet Photo Contest - "PUPPY LOVE"
February is the month when everyone's thoughts turn to love. What do your furbabies love? In honor of Valentine's Day, send in your photo, slide show, or video of your pet with something or someone they love, or what you love most about your pet. Add some words to be posted with their pic to go along with the theme. We'll accepting entries from February 1st through the 14th. Visit us in the forums where we'll be hanging out and introducing the new entries until voting begins on the 15th.